It's the interstellar version of a man overboard — an astronaut, thrown from his spacecraft, drifting helplessly into space. Until recently, safety measures to account for such a situation have been somewhat limited. The idea first emerged last year when John Sinko, an engineer now at Ohio State University in Newark, proposed it as a way to de-orbit space junk. Now, working with Clifford Schlecht at the Institute for Materials, Energetics and Complexity in Greenville, South Carolina, Sinko is developing a prototype device that could save astronauts lost in space. In Sinko's original plan, spacecraft carry thrusters with two types of propellant, each responding to a different laser wavelength. To fire a thruster, a laser beam is shone on it, vaporising propellant to create thrust and so push the spacecraft onto a new course. The propellants fire in different directions, so the spacecraft can be steered. 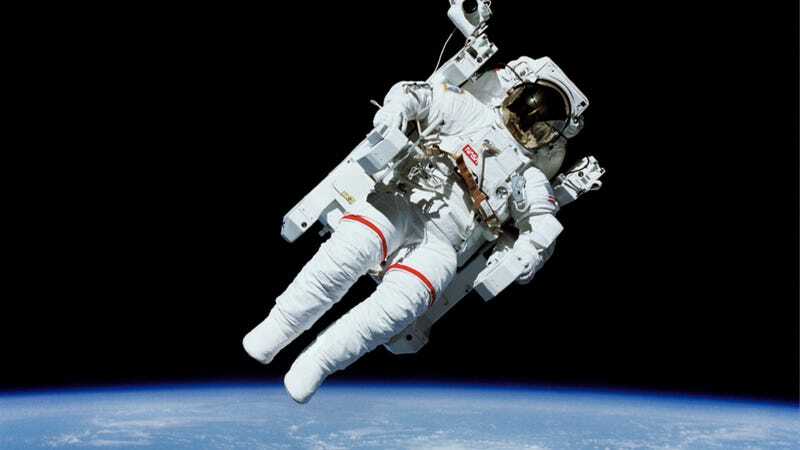 Sinko and Schlecht say that if those space-junk thrusters were scaled down and fitted onto a spacesuit, with tubes to vent propellant away from the astronaut, you would have a way to retrieve a spacewalker who is spinning into the void. You could even apply small thrusters to astronauts' toolboxes - one was lost during a spacewalk in 2008. The best thing about a laser-guided recovery system is that it could be controlled by someone other than the stranded astronaut; in other words, if the stranded astronaut was incapacitated, members of the team could guide her back to the spacecraft remotely—something current recovery systems, which rely on the stranded astronaut being conscious, cannot do.